Yes, monkey bread is a dumb name for what is essentially chunks of yeasted dough rolled in butter and flavoring and baked in a tube pan. Yes, you will sound dumb saying “Hey, I brought the monkey bread!” – but that in no way takes away from the presentation (superb!) and taste (dangerously buttery) of a magnificent monkey bread. Monkey bread has other shameful names…African coffee cake, bubbleloaf, pinch-me cake…and its origins are a mystery. Familiar recipes began appearing in women’s magazines in the 1950s and it quickly became a quirky breakfast favorite, particularly since it encourages eating with your hands…ripping off pieces while the cake is still warm. Nancy Reagan was a fan and served it often in the White House. John and I watched Game 3 of the NBA Finals with Matt and Melissa on Tuesday night, and my contribution was MB…savory style. I love the traditional cinnamon and sugar variety, but I wanted something that would be a little more Budweiser than brunch. I also had to make it after work so I cheated and used a coupon to buy some refrigerated Pillsbury biscuit dough. The result was what I hoped for…a savory, buttery, garlicky, fattening…monkey bread. Preheat oven to 375. Grease a tube or (even better) Bundt pan and set aside. In a bowl, combine cheese, herbs, garlic. Close your eyes and pop open those scary biscuit tubes. Dunk the biscuit halves in melted butter, or use a pastry brush. Assemble (overlapping slightly) in tube or Bundt pan. Sprinkle any excess cheese mixture over the top. Bake until top is golden brown – around 20 minutes, but it may vary. Enjoy the smell of garlic in your home for hours and hours. 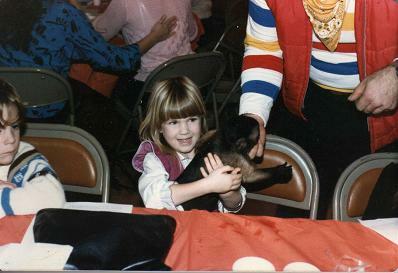 And just for fun, here is a picture of me with a real monkey back in 1986. How have I gone this long without seeing that picture of you with the monkey? Priceless!